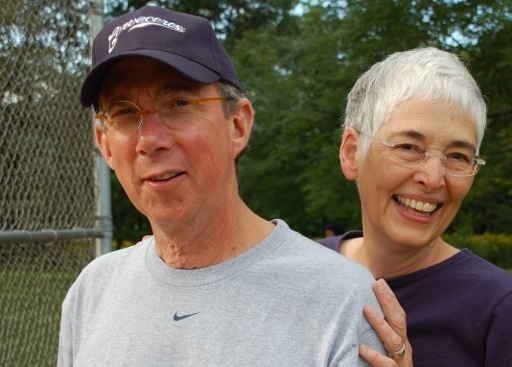 John and Susan McFadden, leaders of the Fox Valley Memory Project. Game playing at a Memory Cafe. 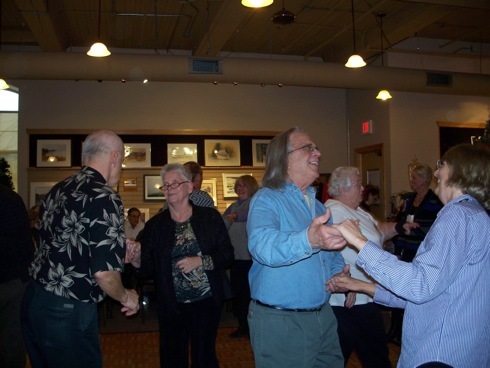 Dancing at a Fox Valley Memory Project Memory Cafe. Fox Valley Memory Project participants about to embark on on boat ride up the Fox River. 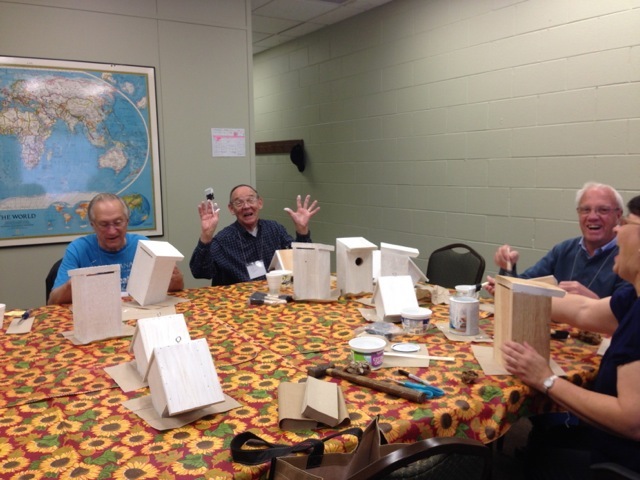 As part of the Fox Valley Memory Project, a group of men meets at the Memory Loss Resource Center to make and paint birdhouses - often in Green Bay Packers colors. In October 2013, John and Susan McFadden ventured to the island nation of Malta for the Alzheimer Europe conference. The subject of the 23rd annual gathering was “living well in a dementia-friendly society,” a topic that ensured the McFaddens would be among like-minded professionals. 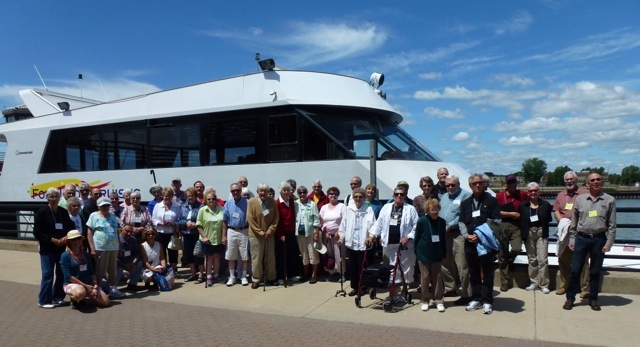 The themes that emerged were familiar to the Appleton, Wisconsin couple, known for their 2011 book,Aging Together: Dementia, Friendship and Flourishing Communities,and for their leadership in the Fox Valley Memory Project, a collaborative organization that offers programs and services that aim to improve quality of life for persons with dementia. The conference theme of inclusion — a commitment to including persons who have been diagnosed with dementia in policy-making and planning — was something the McFaddens already supported and employed. They also had embraced the theme of destigmatization, a social framework that Ambler, Pennsylvania native John McFadden, a cleric, had eloquently argued for in his booklet, Aging, Dementia and the Faith Community. They had, in fact, adopted most of what the European presenters rolled out as best practices in caregiving and could now bear witness for how inclusive, friendly initiatives were transforming lives throughout Wisconsin’s Fox River Valley. Beyond encouraging inclusive representation on boards and committees, the McFaddens have been involved with the opening of seven memory cafes — regional venues for those experiencing early stage dementia, mild memory loss or cognitive impairment, as well as their families and friends. 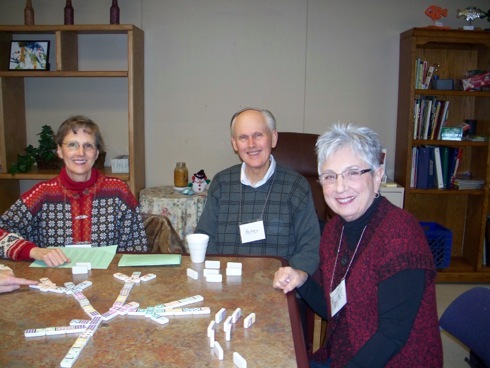 Memory cafes create community. Well-established in the UK and the Netherlands, where the concept was first introduced, Memory Cafes are gaining a presence beyond Europe. In Wisconsin’s Fox Valley, activities at established memory cafe locations in Appleton, Kaukauna, Menasha and Neenah — as well as the newest at Mosquito Hill Nature Center in New London — offer participants an expansive menu of fun. Through events and outings that might include polka dancing, carnivals, trout fishing, ice cream sundaes or prairie wildflower walks, music and refreshments, participants can experience stigma-free social interaction. 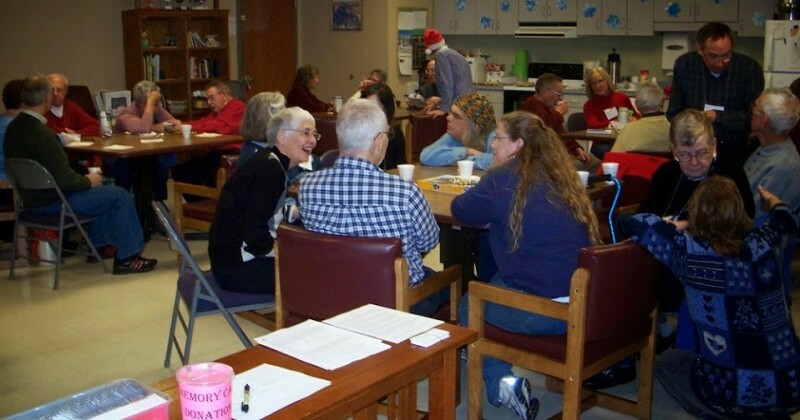 When Susan McFadden, a psychology professor emerita at the University of Wisconsin-Oshkosh, talks about the experience of inclusion and acceptance at the Memory Cafes, she emphasizes their broad appeal. Sometimes, a spouse may come alone, without the partner who is living with the diagnosis, just to be among supportive friends and to recharge. Both McFaddens talk about Alzheimer’s in the gentlest terms. John speaks of persons who are journeying into dementia. Susan speaks of care partners. They are both acutely aware of the power of language and the role it plays in shaping how we are defined by community. If, through dialogue, the illness is destigmatized, then it seems to follow that our response will be altered. When Alzheimer’s is linguistically reframed, perhaps we may become more patient with people who can be seen as voyagers rather than manifestations of our deepest fears about dependency. Maybe we will feel acknowledged for our strengths when we are called care partners, rather than pitied for our involuntary status of burdened spouse. By adopting a new communal rhetoric, perhaps we can effect communal support for the realities faced by the more than five million Americans estimated to have Alzheimer’s, their families and friends. In return, there is the expectation that community will respond accordingly. The McFaddens believe that personal, accepting responses can be extended and formalized as dementia-friendly communities. The embrace of persons who have been diagnosed with dementia begins with their family and friends. Not everyone has the psychological or spiritual framework to deal with the changes that a diagnosis predicts, but as a psychologist and a minister, Susan and John McFadden have developed a lifetime of skills that they can share. They have taught people who have drifted away from their loved one how to be a friend again, and helped spouses take on caretaker roles that they had not been prepared to assume. Beyond the scope of supportive, accepting family lies the supportive, dementia-friendly community. That’s where much of the McFaddens’ energy is currently directed. John McFadden recently told a group of Fox Valley business owners how they can demonstrate acceptance through their participation in the Purple Angel dementia awareness program, another progressive social initiative begun in the UK. The Purple Angel model provides training for participants’ staff, who in turn, display the purple angel decal prominently in their establishment, signaling their business’ awareness and commitment to being helpful. In a collaboration between Appleton Downtown Inc. and the Fox Valley Memory Project, efforts are underway to make Appleton a dementia-friendly community. To become dementia-friendly, a community needs to have resources for early diagnosis, personal and integrated care; responsive customer-service from businesses; appropriate transportation; navigable physical environments; inclusive social activities; programs that challenge stigmas and build awareness, along with programs that help people maintain independence by delivering community-based solutions. The goal of creating safe, friendly communities is thriving in America’s heartland — advocated by the St. Paul, Minnesota non-profit, Alzheimer’s Speaks, discussed at the October 2013 Dementia-Capable Wisconsin stakeholder summit in Racine, and a designation sought after by little Watertown, Wisconsin. It is a goal born of idealism and necessity. For some, it is a concept that is central to the care culture, which is less invested in a future pharmacological cure than in improving quality of life in the present. For others, creating dementia-friendly communities is the proactive, parallel path that might mitigate the needs of aging Boomers while science presses on. In Wisconsin, it is a movement gaining support in the aftermath of a significant court ruling. The May 2012 Wisconsin Supreme Court Helen E.F. decision, which prohibits people with only a dementia condition and no other mental illness from being involuntarily committed for treatment under Chapter 51 of the Wisconsin Statutes, became the impetus for the Wisconsin Dementia Care System Redesign which will increase the capability and capacity of managed care organizations to provide dementia-capable services. But for Susan and John McFadden, dementia-friendly communities are a natural expression of caring values, supported by their individual professions, which demonstrate a society’s ability to value personhood. They believe that these values, being embraced and realized by their colleagues in the UK, can be a good fit for Appleton, Wisconsin, and anywhere that people are capable of being patient, helpful and loving. They are committed to sharing that vision, talking it up in the Fox Valley and beyond. Deborah Fries is the author of two books of poetry – Various Modes of Departure (2004) and The Bright Field of Everything (2014). She is a columnist and editorial board member of Terrain.org: A Journal of the Built & Natural Environments, and was the Poet Laureate of Montgomery County, Pennsylvania from 2006 – 2007. Her poem “Twitch” can be found in The Bright Field of Everything. In 2011, Edna Schmeets received a phone call saying that she had won $19 million and a new car.